Sydney - South African pace spearhead Dale Steyn sounded an ominous warning before the Test series with Australia with a fiery spell of bowling in the drawn tour match with Australia A here on Sunday. Test cricket's No 1-ranked bowler produced a hostile spell described by team-mate Jacques Rudolph as Steyn's fastest in seven years. Steyn terrorised the Australia A top order with a five-over salvo, taking the wicket of Liam Davis in his haul of one for four. Davis lasted 11 deliveries before being caught behind for a duck, while Rob Quiney (11 not out) and Phil Hughes managed to survive the hostilities before an early stumps was called. Former Test opener Hughes faced the majority of Steyn's 150km thunderbolts in the final hour of play, scoring one run off 27 balls. 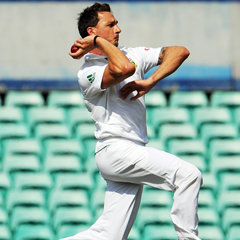 Rudolph said Steyn's spell was one of the fastest he had seen. But he cautioned that the South African pace attack, which also includes Vernon Philander and Morné Morkel, should not get too excited at the prospect of a juicy pitch for the first Brisbane Test this week. "What I've heard is that it seams a little bit. It sort of suits us in South Africa - it's the kind of wicket we play on," he said. "(But) I think for our bowlers, it will be important not to get carried away with the bounce. "I think the length on those kind of wickets is quite important. We've got to try and settle into that as quickly as possible." In an ominous sign for Australia's out-of-sorts openers Ed Cowan and Dave Warner, Steyn finished with match figures of 4-58 with eight maidens on the placid SCG pitch. Australia A skipper Andrew McDonald said Hughes's plucky display against the fearsome Steyn was testament to his new-found maturity and hinted it would serve him well should a Test call-up be imminent. "I hope that Phil Hughes grows a leg from that. He got tested by Dale," McDonald said. "I think Dale threw everything at Phil and Phil got through. "I think that's always a confidence booster going into whatever may lie ahead for Phillip Hughes." Earlier, Hashim Amla scored a half-century before he retired to allow AB de Villiers to bat in South Africa's first innings declaration of 277. De Villiers scored 24 off 51 balls before he was caught off an inside edge, while J.P. Duminy chopped one from Andrew McDonald on to his stumps for 31. Rudolph spent a long time at the crease for his 39 before he was caught at slip. Davis was not Steyn's only victim on the final afternoon, with Proteas wicketkeeper De Villiers catching one of his bouncers on the end of his fingers. De Villiers quickly flung his glove to the ground and winced in pain, although he managed to finish the day's play. The first Test at the Gabba gets underway on Friday.